The setting of a great book can prove to be just as memorable and relevant as anything else in the story. 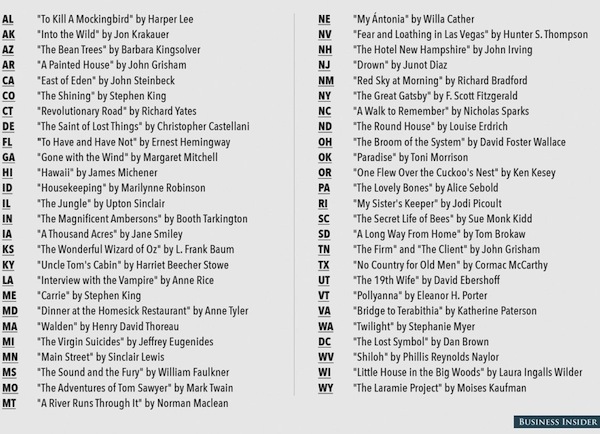 So when we consider the most famous book set in every state, it's actually not all that difficult to guess some of them. For example, Maine would probably be something Stephen King, right? And if you guessed The Great Gatsby for New York, you'd be correct. What about good-old Washington? I'll give you a hint: Think vampires. BusinesInsider seems to have a thing for maps. Remember when they posted these maps that break down how people in different parts of the country say certain things, like soda, pop, sneakers, etc? 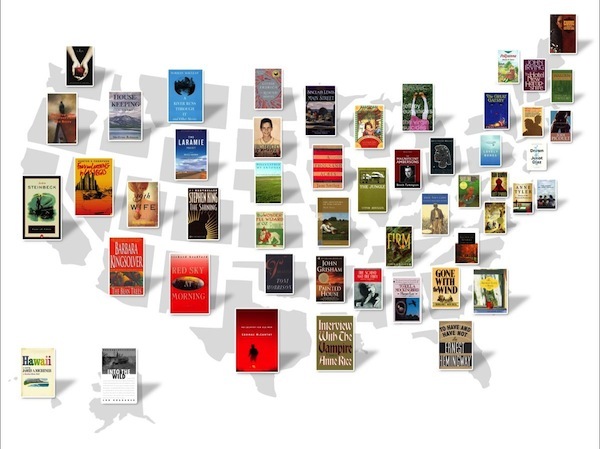 Well, their recent map gives us a look at the most famous books from each state. Check it out below and click the image to view it full-size over at BusinessInsider. So we have Twilght up in Washington, and The Firm and The Client in Tennessee. Just as Stephen King was probably always going to win Maine, so too was John Grisham going to have the market corned on anything Memphis/Tennessee-set, right? Katherine Paterson's Bridge to Terabithia took the spot for Virginia, while Anne Rice's Interview with the Vampire is holding it down for Louisiana. For Illinois, there's Upton Sinclair's classic The Jungle, and for Florida, Ernest Hemingway's To Have and Have Not. On the subject of classics, Georgia is represented by Gone with the Wind, while Alabama has To Kill a Mockingbird, one of my personal favorite books. John Irving's The Hotel New Hampshire is the most famous book set in New Hampshire, while Stephen King's Carrie took the Maine spot. Carrie was King's first published novel. The book's feature adaptation was recently remade and due to hit theaters this weekend. Born and raised in Maine, it's no surprise that many of King's stories are set there. If King's imagination were real and we were all living in it, I'm not sure I'd want to visit Maine, let alone live there, but I absolutely love his use of the state in many of his books, including It and Dreamcatcher. But King's books aren't exclusive to New England. In fact, he managed to secure the state of Colorado for the above map, with The Shining. Another favorite book of mine that made the list was Alice Sebold's The Lovely Bones, which is set in Pennsylvania. The dark novel about a girl who looks down from heaven to watch her friends and family move forward in the aftermath of her brutal murder was adapted for a film starring Saoirse Ronan, Stanley Tucci and Mark Wahlberg back in 2009. John Steinbeck's East of Eden is on there for California, while Nicholas Sparks' A Walk To Remember is the most famous book set in North Carolina.